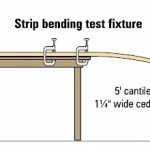 If you build enough strip plank projects, at some time or another you will need to bend strips around a curve sharp enough to break the wood strip. Here’s how to make bending the strips possible. Make the wood thinner. Saw the strip through the vertical axis to make two thinner slats. You do not need to saw the entire length of the strip, just the area where the strip needs to be severely bent. Of course, the sawn slats will be thinner than the original strip material by the width of the saw blade. Use a strip of thin wood the width of the saw blade to fill the saw kerf. Now you have three strips of veneer which add up to the total of the strip plank thickness. Three thinner veneers are much more bendable than one thick one. 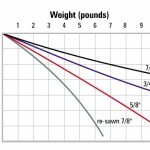 The chart (gallery) shows the ease with which a “re-sawn” 7/8″ strip can be bent compared to three different thicknesses of unsawn strips. When you install the strip, apply epoxy to all surfaces, bend the stack of three pieces, clamp and allow the glue to cure. From the outside and inside the strip looks like the rest of the strips.